I recently celebrated my 23rd birthday, so naturally I enjoyed a few glasses of wine...and a few beers...and a few shots...and some cocktails. Needless to say, I wasn't feeling my best the day after. Rather than heading to the pub or going out clubbing, I decided to mark this celebration with my family and a few close friends in my own back garden. What I love about drinking at home is the unlimited capability for experimentation. What's more, the creation of cocktails often coincide with the creation (and subsequent demolition) of good memories. I want to present to you two of my own creations that, for me, invoke great memories and are perfect for summer days like these. 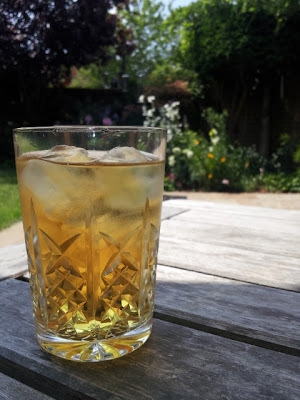 The first is somewhat of a student drink, although it's perfect for evenings when you run low on proper mixers, or for when you're roughing it in the middle of nowhere or want to use up the contents of your cupboard. The second is one of the best booze/mixer combinations I've ever come across. The methods are simple and the ingredients are readily available from all supermarkets, so away we go! First up is a team effort that was created a few years ago in a rowdy campsite in Newquay. Now, we made this in the 7up bottle to give it that extra rough-and-ready feel, but if you want to class it up, serve it in a highball with ice. This next one is probably one of the most simple mixological creations ever, but quite honestly one of the most tasty and satisfying. This was created on a family holiday in Cornwall. Basically, we'd run out of coke, but when we tasted this we were converted for life. It couldn't be simpler: half fill a tumbler with ice. Pour rum over the ice until it reaches the top of the cubes (around half way up the glass). Top it off with apple juice and give it a stir, and voila! It is quite important to get the ratio right on this one: if it's too weak it's just juice but if it's too strong it's quite sickly. You want to get it so the flavours of vanilla and cinnamon from the rum really shine through the sweetness of the juice without it seeming too alcoholic. It seems a lot but a ratio of about 1:2 seems to be the tastiest. So there you have it, my good people. Two simple creations from the depths of my own mind that I wish to share with you all. Now go my children and create! Have you got any cocktail creations stories? Let us know in the comments.